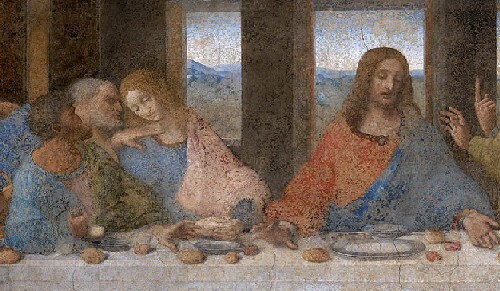 For the art lovers, you may wish to see the high-resolution print of The Last Supper by Leonardo da Vinci at this site. The original was painted with tempera on the wall of the hall of the Refectory of the Saint Maria delle Grazie Convent in Milan in 1498. The size of the painting is 29 ft by 15 ft. When I was in Milan a few years ago, I queued up for 2.5 hours and paid about HK$100 for a 20 min visit. It is now easy to see. The size of the print on this Internet site is 16 gigabytes. You can zoom in to see the fine particles of the heavily eroded wall, which I could not see at the real location. The print was said to be composed with 1677 photographs. Please see a section I cut from the print. This is the main area of the painting depicted in The Da Vinci Code as revealing a secret message hidden by Leonardo da Vinci. The figure on the left of Jesus was said to be John by the historians. He/she looked quite feminine. The fiction said Leonardo da Vinci was actually painting the portrait of Mary Magdalene, recorded by many literature as one of the disciples. When moved horiziontally to the right of Jesus, Mary Magdalene was leaning on the shoulder of Jesus. Also, the figures of Mary Magdalene and Jesus formed the letter M, representing the Holy Grail. This fiction has driven many millions more people to read the Bible.